Olive Garden servers get new duds. 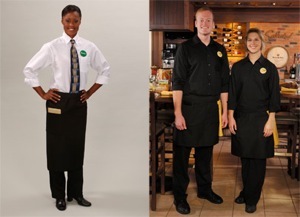 Anyone who hates getting a stranger’s necktie in their plate of reasonably priced pasta will be glad to hear that Olive Garden is getting with the times and changing its servers’ uniforms for the first time since 1982. No more white shirts bearing stained signs of kitchen mishaps, and no more ties dipping into your unending bowl of minestrone. “Sprockets” is the name for the new all-black uniforms, and is the first makeover since the chain was born in 1982.